Are you rebranding? Or just want to find some outdated text? Well fear not. Your time trawling through Google for outdated text on your site is over. VisibleThread Web can easily do this for you. How? You can find terms using VisibleThread Web’s custom dictionaries. 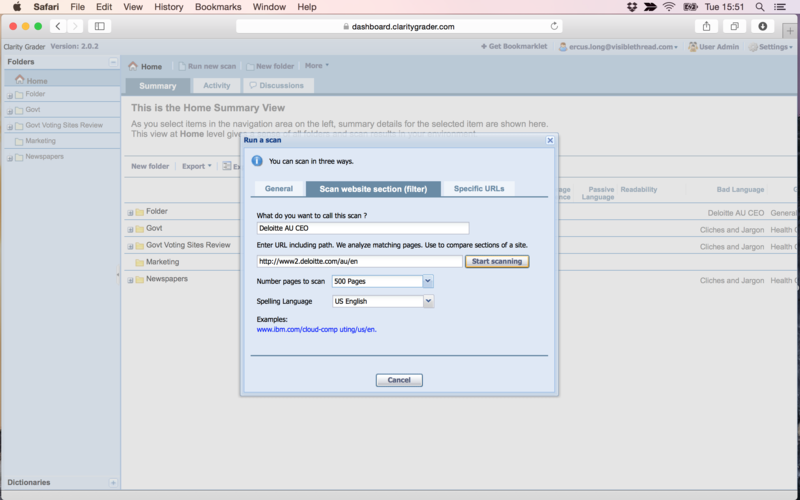 The tool will identify each page and paragraph they are located in. Pretty neat, eh? Rebranding – You’ve changed brand name and need to remove the instances of the old brand name. Outdated Terms – You want to change your tone of voice or need to remove old brand terminology. Staff Change – A staff member has left the team and you want to remove mentions of their name from the site. 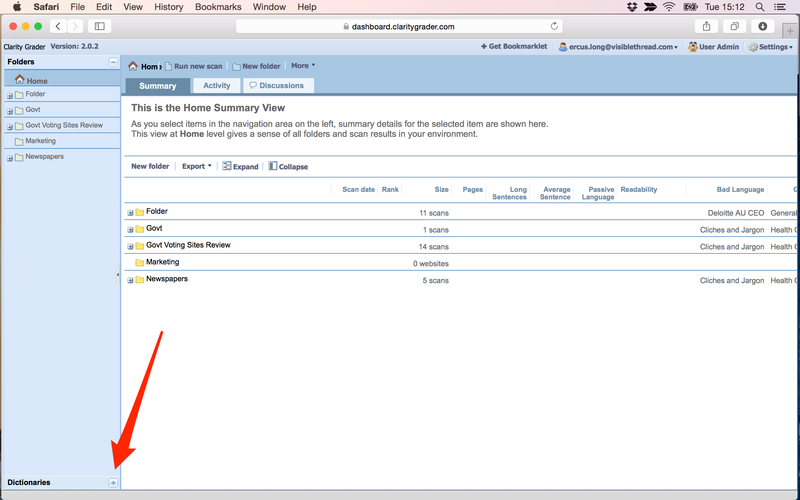 Finished Product lines – A product line has been removed and you want to remove instances of it. Legislation – Due to legislation you have to remove, add or change a term. Earlier this year, Deloitte Australia announced Cindy Hook as their new CEO. So as an example, I’m going to run a scan using VisibleThread Web to identify any mentions of their previous CEO Giam Swiegers. 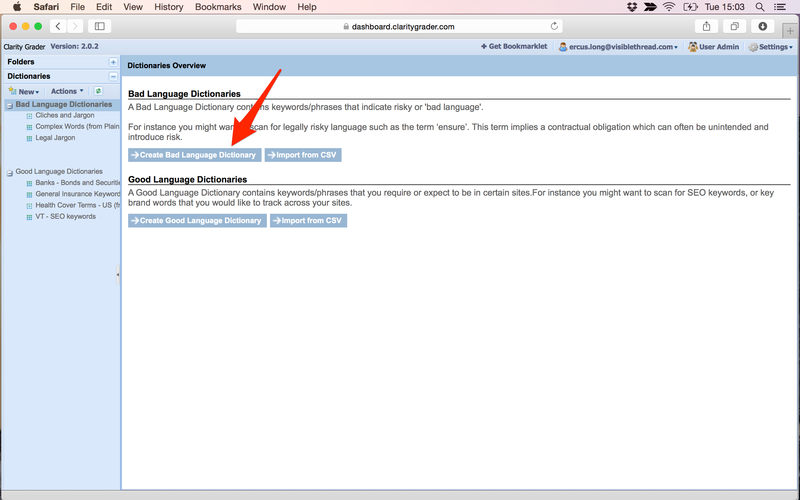 Simply open the dictionaries tab in VisibleThread Web. You can see it located at the bottom left of the screen. Once selected you will see you can create bad language and good language dictionaries. As a rule of thumb we use bad language to indicate language we want to remove and good language we want to highlight as positive language use. (Sounds simple and it is!) With both you can add a list of terms using an Excel CSV file or add individual terms yourself. As we want to highlight an error (mentions of Giam Swiegers) let’s create a Bad Language Dictionary. To do this simply click Create Bad Language Dictionary as seen below. Next we name the dictionary. 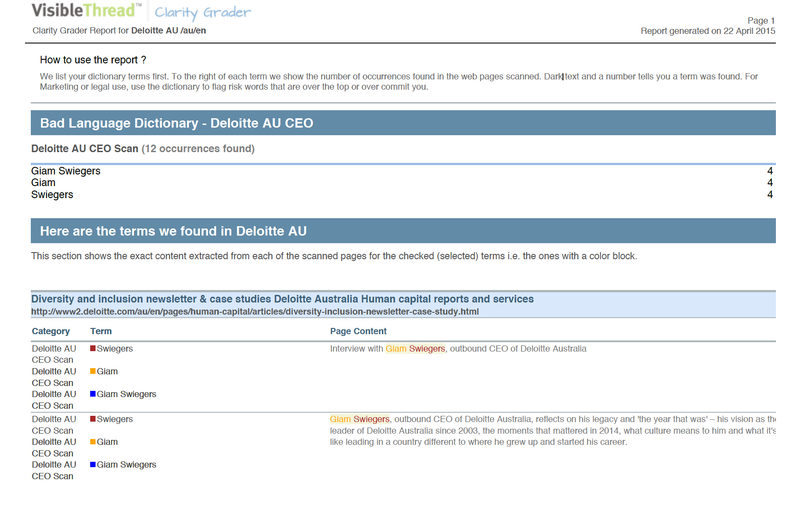 For this example I used the name Deloitte AU CEO. Then we add a category and name it. I named the category Deloitte AU CEO Scan. I then added the terms Giam Swiegers, Giam and Swiegers. As you can see in the below I only want to scan the Australian section of the Deloitte site. So I select ‘Scan website section’. For the purpose of this example I have scanned 500 pages. Once the scan is complete we can see the bad language tab highlights any instances of the terms in the dictionary. As we can see in the below we have several instances of the term. 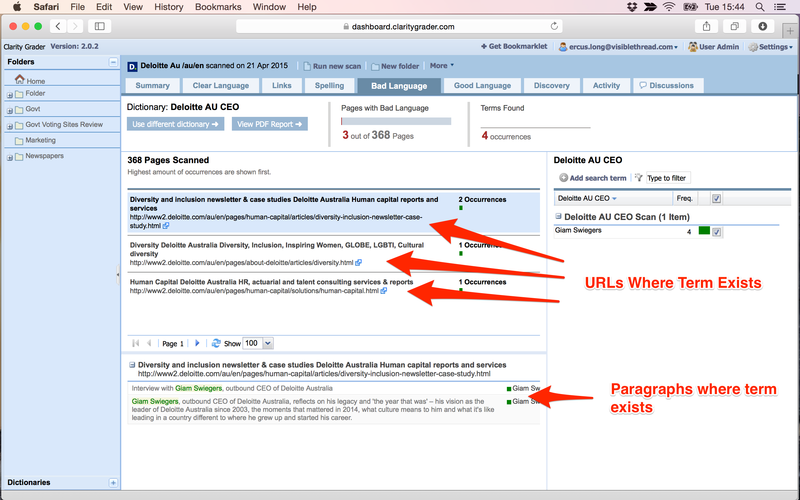 We can dive deeper and locate which URLs and paragraphs the terms appear on. We do this by going to the Bad Language tab for an individual scan. The top view below shows each page the terms exists. The bottom view shows the paragraph on each page where the term exists. From the below we can see several instances of Giam Swiegers. But….The good news for Deloitte is they are all referencing Giam Swiegers as the ‘Outbound CEO’. Great work by their team! For anyone reviewing, proofing or auditing content the PDF report is a lifesaver. It’s located below the tabs at the top of the screen. Here’s the PDF report of our example. It clearly outlines the bad language areas to be improved and where they are located. This PDF can be sent to writers to alter text or to potential clients to highlight areas of improvement. Below is a screenshot of the PDF. That’s a brief overview of how you can use VisibleThread Web to identify outdated terminology. If you have any questions please feel free to leave a comment below. APMP Bid and Proposal Con 2019 – Will you be there?